By Kori ~ January 30th, 2013. Dry Creek Vineyard, founded in 1972 by David Stare, is located in the heart of Dry Creek Valley just outside of Healdsburg, California. Today, Dry Creek Vineyard is run by Davidâ€™s daughter Kim Stare Wallace and her husband Don. Well-known for their FumÃ© Blancs and Zinfandels, Dry Creek Vineyard also produces a number of other excellent wines including their Cabernet Sauvignon and Cabernet-based blends. We recently had the opportunity to taste the 2008 Meritage and the 2008 Endeavour Cabernet Sauvignon in a blind samples tasting. Dry Creek Vineyard has a long history with Meritage, dating back to 1985 vintage when it was the first winery to use the term on a wine label. 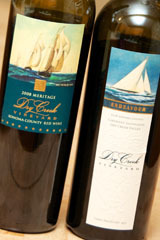 Meritage is a blend of five Bordeaux varieties. While primarily known for Zinfandel, the Dry Creek Valley actually has more Cabernet Sauvignon planted than any other variety. The fruit for the Endeavour Cabernet Sauvignon is sourced from Dry Creek Vineyardâ€™s Endeavour Estate Vineyard. Located in the Lytton Springs area of Dry Creek Valley, Endeavour is a sustainably farmed vineyard. We continue to be impressed by the quality wines being produced by Dry Creek Vineyard, and the people behind the winery are wonderful folks to boot. Both of these wines are worth a try if you see them on the shelf at your local wine shop or on a restaurant wine list. And if you are visiting Sonoma County, I highly encourage you to visit Dry Creek Vineyard. 2008 Dry Creek Valley Meritage (Sonoma County, California): 33% Cabernet Sauvignon, 30% Merlot, 17% Cabernet Franc, 14% Malbec, and 6% Petit Verdot. Dark purplish red in color. Very aromatic with black cherry, blackberry, molasses, and smoke on the nose. Black fruit, smoke, and cocoa come through on the palate. Medium to full-bodied with lively acidity and medium to high tannins. Well-balanced with a long, smooth finish. 2008 Dry Creek Vineyard Endeavour Cabernet Sauvignon (Dry Creek Valley, California): 91% Cabernet Sauvignon, 7% Petit Verdot, and 2% Merlot. Dark, dense red. Jammy black fruit, molasses, and cinnamon come through on both the nose and palate. Medium to full-bodied with lively acidity, medium tannins, and a medium to long finish.